In 2014, Russia annexed the Crimea and attempted to seize a portion of Ukraine. While the world watched in outrage, this blatant violation of national sovereignty was only the latest iteration of a centuries-long effort to expand Russian boundaries and create a pan-Russian nation. 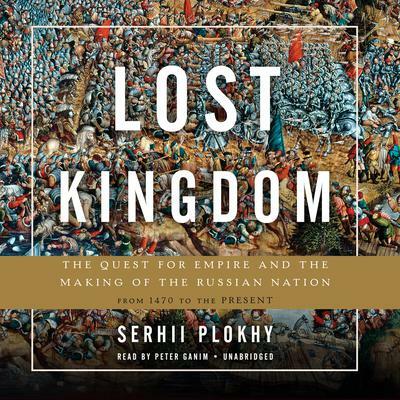 In Lost Kingdom, award-winning historian Serhii Plokhy argues that we can only understand the confluence of Russian imperialism and nationalism today by delving into the nation's history. Spanning over 500 years, from the end of the Mongol rule to the present day, Plokhy shows how leaders from Ivan the Terrible to Joseph Stalin to Vladimir Putin exploited existing forms of identity, warfare, and territorial expansion to achieve imperial supremacy. An authoritative and masterful account of Russian nationalism, Lost Kingdom chronicles the story behind Russia's belligerent empire-building quest. In Lost Kingdom, award-winning historian Serhii Plokhy argues that we can only understand the confluence of Russian imperialism and nationalism today by delving into the nation's history. Spanning over 500 years, from the end of the Mongol rule to the present day, Plokhy shows how leaders from Ivan the Terrible to Joseph Stalin to Vladimir Putin exploited existing forms of identity, warfare, and territorial expansion to achieve imperial supremacy. An authoritative and masterful account of Russian nationalism, Lost Kingdom chronicles the story behind Russia's belligerent empire-building quest.